Skunks. These striped (and sometimes spotted) mammals are infamous for their nauseating spray and can cause homeowners quite the headache if they get into their gardens. During the winter months, wildlife like skunks like to get into homes for shelter. Here is all you need to know about skunks and their habitats! These animals are easily recognized with their black and white coloring. However, the coloring of striped skunks can vary from nearly all black to all white. 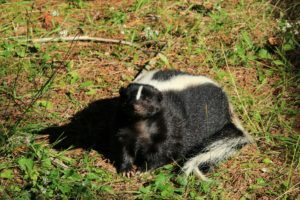 The most common skunk in the Southeast is the striped skunk or Mephitis mephitis, but the southeast also has spotted skunks known as Spilogale putorius. Spotted skunks are smaller than striped skunks, but both species have feet equipped with long claws for digging and short legs. The breeding season starts in January and ends approximately in March. Males will pursue the females and will travel four to five miles per night! But all his hard traveling could be for nothing. Females will spray males they deem unworthy who try and mate with them, but should she find him suitable, the gestation period for a litter of skunks is approximately 7-10 weeks. The litter, on average, will consist of 4-6 babies who will stay with their mother until fall of that year. Where do skunks live, and what do they eat? Skunks can live in a wide variety of places both urban and rural. You can find them in clearings, pastures, land bordering forests and wooded urban areas like parks and subdivisions. They will dig dens under logs and driveways, or will make themselves at home underneath decks, crawlspaces and other secluded areas. These animals like to eat insects and will dig in the ground for grubs and other bugs. Mice are also an important item in their diet, but other small mammals can become prey when food is scarce. Can they cause any damage? Skunks can be a nuisance pest by digging holes in your lawn or by making a den underneath your residence. The primary concern of a skunk near your home is the risk of rabies. Skunks are known carriers of rabies and can transmit the disease to household pets who in turn can transmit the disease to humans. If you see a skunk wandering around during daylight hours and that seems tame or listless, contact your local police department or animal control as these are signs of rabies. 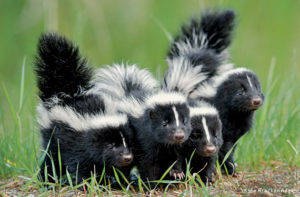 Another issue that concerns homeowners is the skunk’s pungent spray, but skunks will give plenty of warning before spraying someone. If you see a skunk and they start stamping their front feet and/or arch their tail over their heads, back away. They’re getting ready to spray. The reason they do give so much warning before spraying is because it takes a long time (up to 10 days) for them to regenerate their primary defense mechanism. Can I prevent skunks on my property? During cold winter months, skunks along with lots of other wildlife will try and make their way into our homes for shelter. Make sure your home has no openings along the foundation and all window and doors screens fit tightly with no holes. Mice can squeeze through holes the size of a dime and other pests will certainly make their way in if they can find a way. Specifically for skunks, make sure your trash bins are sealed and pet food is picked up. Can Gregory get rid of my skunk problem? If you have a skunk issue, call Gregory today! Our wildlife experts will take care of the problem and can educate you on exclusion methods that could help keep other pests from making your property their home.